note: Photo above used for reference only. No hex cuts shown. The Sidewinder Mag Carrier is a wide pancake style magazine retention device thats is designed for max weight distribution and low profile concealment. It makes for a very well balance magazine retention device and can be used on 1.5″, 1.75″ or 2.0″ as well as MOLLE platforms. The 1.5-2.0″ options feature our innovative injection molded quick connect clip whilst the mole option utilizes the Mallice clip. A innovative feature that separates our carrier from others is a angled spacer to lightly post he magazine outward just far away enough from the body for ease of magazine retrieval without compromising conceal-ability. Estimated production time: 2-3 weeks from time of order to the time it ships. 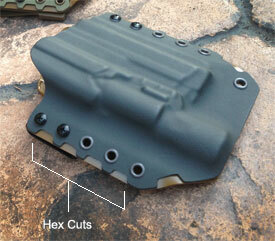 Hex cuts are those little scallops cut into the side of the holster so the bottom color shows through or in a single color holster you can get them cut all the way through to have a gear like look to your holster. Inform me on upcoming products and promotions.